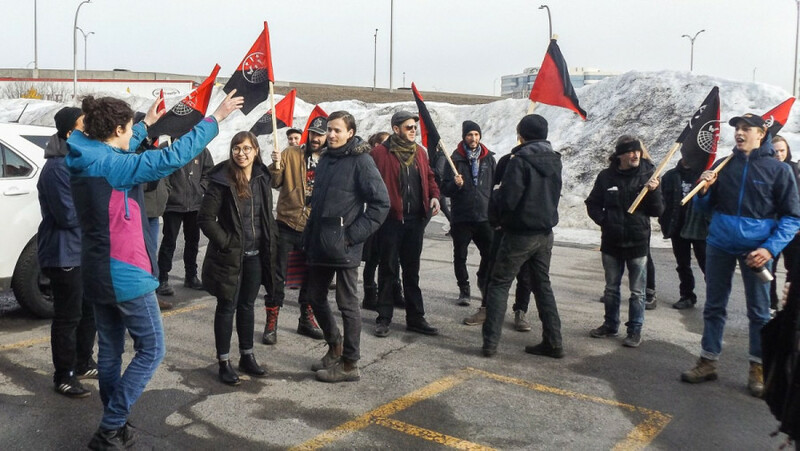 To chants of “Solidarity Forever,” 30 protesters marched to the Montreal branch of Heritage Coffee, Wednesday morning, to demand the reinstatement of two former employees whose jobs were suddenly terminated. Tessa Mascia and Kyle Shaw-Müller had attempted to unionize the company’s eight-person workforce and organized weekly meetings with other employees to discuss their working conditions. Mascia said that when the company learned that she intended to draft a letter demanding a $15 an hour salary, she was fired. Protesters stood outside between the front entrance and its garage on the side of the building, located at 5715 Saint-François Rd. in Ville Saint-Laurent. They formed soft picket lines at first, but eventually hardened them, blocking clients from entering the warehouse to collect their orders. Shaw-Müller said when the company learned that he was going to lead the workers on a march to the bosses’ office on Monday demanding Mascia’s reinstatement, he was immediately fired. “I think it’s a clear intimidation tactic from management to thwart any unionization efforts,” said Mascia. Heritage Coffee declined to comment on both Mascia and Shaw-Müller’s allegations. Mascia had mutual connections with Max Baru and Selena Phillips-Boyle, caseworkers at the IWW. After a successful phone zap on Monday, where they asked their friends to call the company’s four offices to clog their phone and fax lines, they organized the protest. “Although anti-union attitudes from employers of this type is typical, this one is being especially aggressive,” said Baru. Brian Martell, the company’s chief operating officer, was visiting the company’s main branch in London, Ontario. Ian MacKenzie, the manager of the Montreal branch was left in charge. When the protesters knocked at the garage door, he answered but would not rehire the workers. “I have no control over anything, here,” he said. What had the protesters confused is that Shaw-Müller said MacKenzie was the one who fired him. The protesters continued to speak over MacKenzie every time he came out of the building. He attempted to get the protesters’ sympathy to no avail by saying he’d been a worker since he was eight years old. Before long, a few police cars showed up. By the end of the protest, there were 10 police cars on the scene and officers entered the warehouse but didn’t interfere in the protest. No arrests were made. Shaw-Müller believes that their protest at the very least gave management something to think about. Since the former employees believe they were fired without written warning or for just cause, he and Mascia will look into taking legal action with the Commission des normes, de l‘équité, de la santé et de la sécurité du travail, which enforces Quebec’s labour laws. They hope to either be re-hired or receive a full year’s salary.